Born with a debilitating physical deformity, Adzo was hidden away by her family from the time she was born and never had the chance for a real childhood. But thanks to Compassion’s Child Sponsorship Program, Adzo has been healed and is enjoying the chance to go to school. 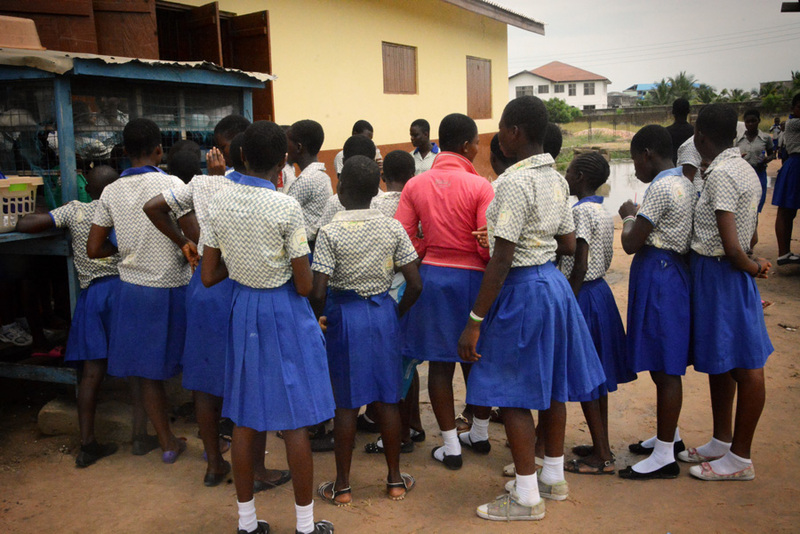 Adzo* is a 16-year-old girl from Ghana, who is in the equivalent of grade seven—four years behind her peers. But everybody who knows this young girl, including her grandmother Agnes, know it’s a miracle she has made it this far. Adzo was born with a congenital deformity in her bowel causing her to involuntarily pass both urine and faeces. When she was young doctors told Adzo’s parents she needed urgent surgery. But money for the family was so scarce they could not afford it. Adzo was left to struggle with the condition throughout her childhood. Her condition worsened as she grew older. A dreadful smell followed her all the time because of the uncontrollable bowel movements. She was hidden away from the public and even from distant relatives. When Adzo was about four years old, her father became ill and died shortly after. Not long after, her mother had to be hospitalised. It was at this time when Adzo came under Agnes’s care and Agnes discovered the scale of her granddaughter’s issue. So Agnes continued to keep Adzo out of the public eye. She did not allow her to go out to play with other children. If Agnes needed to go out with her, Adzo was heavily padded to avoid her soiling her clothes. Agnes refused to ask for help from anyone for fear people would get to know their issue and discriminate against them. One day a neighbour informed Agnes of the Compassion Child Sponsorship Program through the local church. At first unsure, Agnes agreed to registered her granddaughter. Compassion staff immediately recognised that Adzo wasn’t well. Lydia, the centre coordinator, knew they had to do something. “We all saw how unwell Adzo was on the registration day. So I personally decided to follow up on her later,” says Lydia. Agnes was encouraged to share her plight when she saw how far the staff went to ask about Adzo. She realised they were not prying but genuinely wanted to help. Compassion staff immediately helped Adzo access medical treatment. Adzo was in hospital for over five weeks before she underwent surgery. Through the Health Fund, Compassion paid the entire bill. Adzo returned home totally healed. Agnes was overjoyed. “Anytime I look at Adzo now, I ask myself why I kept quiet for so long. Maybe if I had spoken earlier, help would have come quicker,” says Agnes. Adzo was enrolled into school for the first time and received additional support through the Highly Vulnerable Children’s fund as Agnes is unemployed. Adzo initially struggled in class so the Compassion centre organised extra classes for her and other children who are below the average performance in school. The staff hope this will assist them to reach their potential and encourage them in their studies. Adzo doesn’t yet know what she wants to be in the future; for now, she is just happy to be here alive and leading a normal life as a 16-year-old girl. The Medical fund is a lifeline to children in Compassion’s programs facing ongoing sickness, pain and even death. It supports children whose medical needs go beyond what sponsorship can cover. Whether it’s a critical illness, an accident or an infection, your gift will help stop the suffering of a child in poverty. Please donate today.